RTÉ News studio in Dublin has been upgraded with a range of AV solutions, designed and installed by Ion Solutions. RTÉ is the national public service broadcaster, and its main news studio is home to the Six One News, Nine O’Clock News, One O’Clock News, News with Signing, news2day for young people, The Week in Politics, Leaders Questions, and other special events live programme coverage such as national commemorations. Studio 3 is the busiest television studio in Ireland, broadcasting over 1,700 news bulletins and programmes each year. The new upgrade includes a 24m x 3m videowall, which spans three sides of the studio and utilises Absen LED technology, Sony HDC-P1 HD camera systems and a Viz MultiPlay videowall controller, all supplied and installed by Ion Solutions. Other features include a new set design and additional presentation areas, meaning content is delivered in a more visually engaging manner. Ion Solutions’ in-house technical team designed the bracket system, which allows the videowall to be installed very close to the studio walls. Compared to a standard bracket system, this bespoke design increased space on the studio floor by 30sqm. Kevin Moore, director of Ion Solutions, commented: “At Ion Solutions, we work with some of the most progressive, pioneering brands in the world to deliver top class results. 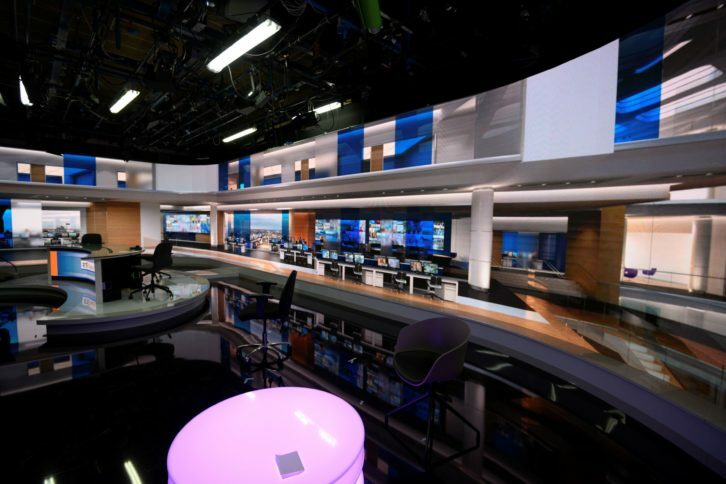 “We’re delighted that RTÉ News chose Ion Solutions to work on the upgrade of their flagship Studio 3 project. A lot of time and work has been put into this project, and we are happy that we were able to successfully meet RTÉ News’ requirements.